The Detective Pikachu movie hasn’t even released yet, and it seems that there are already plans to make a sequel. According to the Hollywood Reporter “Legendary has begun work on a sequel to its Pokemon-based movie, hiring Oren Uziel to pen the script”. The Hollywood Reporter explained that this decision is a “sign of confidence” about the success of the film, which isn’t supposed to release until May. As for Uziel, he has worked on the Sonic the Hedgehog movie, Men In Black International, 22 Jump Street, The Cloverfield Paradox and “a Supergirl feature”. They have a bunch of Pokémon models now, may as well milk them. Not a Pokemon though, Sonic the Hedgehog is also coming to the silver screen in 2019. Last November 2018, there was also Ralph Breaks the Internet. It seems the film industry has been helping the gaming industry to emerge from the shadows. I haven’t watched them yet but I know I will enjoy them. I hope the game Detective Pikachu also gets a sequel too. Is Sony (PICTURES) gonna be involved in releasing the sequel? Because different = bad huh? In other words, not always, and sometimes even better. Different doesn’t always = good, and it doesn’t always = bad. In fact, the difference in something doesn’t make a difference in its quality. Despite how different something is, there’s still a story to tell and an audience to compel with said story, along with visuals and scene shots/compositions to help convey that story; writing, pacing, etc. How different something is plays almost no role in those things. Difference can play a role in some things though. Like when pitching ideas or concepts to executives. But the audience watching the product won’t like or hate a movie because it’s different; they’ll love or criticize it because it could’ve been significantly better or worse. This was probably better directed to the other person and not me. Now I’m curious to know which movie have you seen that has been adapted from a game (we can even include anime if you want)that has actually been good ? I can’t think of any that I can say werent mediocre at best. I truly don’t think it will matter to you since you seem to keep pushing that adaption = bad. Resident Evil was indeed pretty good. I was actually thinking of rewatching some a few days ago. There better be a Lucario in the sequel if there isn’t one in the first movie. I hope we see more pokemon movies like this as a theatrical release and i hope we get lucario in the sequel and new generation pokemon. 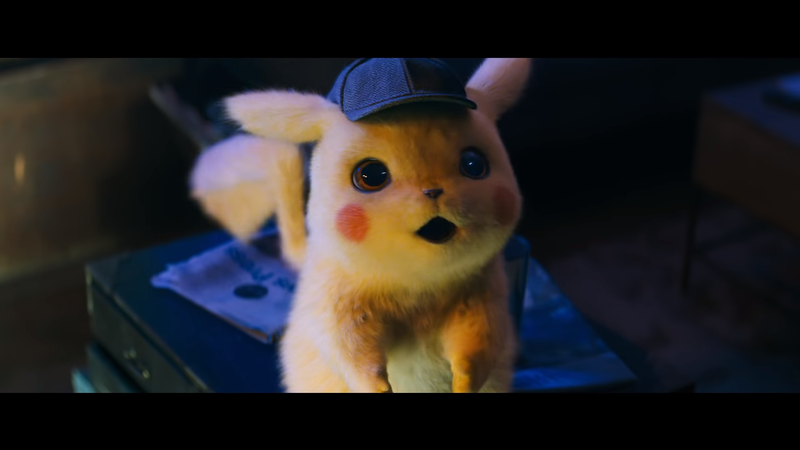 Was hoping for a more normal PKMN movie after this Detective Pikachu movie was over, but I guess I will still have to wait. That’s bold. A little too bold. I don’t believe this rumor. I believe that if this movies does good at the box office, it will only be because there’s SO many Pokémon fans (and people who’s curious). But not really because it’s actually good. I have extreme doubts about this movie. Yeah, indeed. Why watch a movie if you can judge it by its cover, right? Nintendo and Ubisoft take notes. I if you want to sell a bc weak console and aimed at 20mill then you need to make games immediately. When Ps5 and Xbox 2 comes out in order to still have strong Switch sells, then you need Starfox ,a 3D Doneky Kong, another Metroid Prime after working this current one. Pikmin 6 and 6. A new Zelda for the Switch. Another 3D Mario game for the Switch. And 4 years later another Smash brothers and Mario Kart and Mario Strikers tittle. Stop taking 8 year breaks between tittles. Make a NSMB switch 2 D and work on Luigi’s Mansion 4 now. That way by the time Ps5 and Xbox 2 arrives at least the Switch will have those games. Also Switch will need another hardcover core Pokemon tittle and realise it when PS5 comes. That way the Switch sells can still be strong. If Nintendo did this, all they have to do is release a tittle everytime Sony and Microsoft or 3rd party release their strong sellers. You’re not the real Gruntilda, she rhymes, you don’t. I know I know cappy. Your Gruntilda has been crappy. I just wanted to get my point across. Because I want the Switch to win not sold at a loss. Remember on Banjo-Tooie, all the time, I didnt rhyme. If Nintendo doesnt start changing how quick they make new tittles of years space and bring that closer they will just have a new console. I’m not going to keep paying $300 to $350 just to play a new Pikmin or Zelda tittle or a 3D mario tittle on a new console. Just because these developers wont make games immediately.